To address factors that affect conditions for learning and impede the creation and maintenance of safe and supportive learning environments (e.g., bullying, harassment, violence, substance abuse, and inequality), States and districts across the country are implementing programmatic interventions or developing initiatives to improve student outcomes. To celebrate these efforts, the National Center on Safe Supportive Learning Environments (NCSSLE) developed State Profiles for each state highlighting current programs. State Profiles can be accessed through the interactive map and dropdown menu below. As highlighted in the map, the National Center on Safe Supportive Learning Environments (NCSSLE) serves three sets of grantees: Project Prevent (P2), and Promoting Student Resilience (PSR), Safe Supportive Schools (S3), grantees. 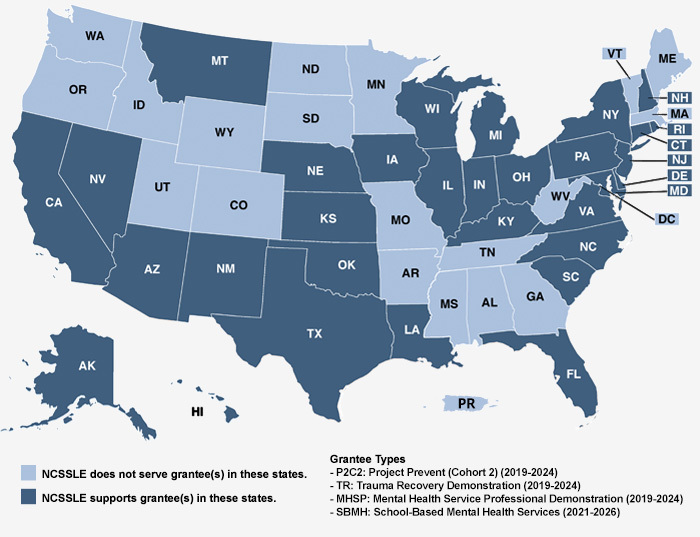 On the map, states with only an S3 grant are orange, states with only P2 grants are dark blue, states with only a PSR grant are bright blue, states that have both S3 and P2 grants are green, and the state that has both S3 and PSR grants is red. If you would like your program featured on your State Profile, send an e-mail to ncssle@air.org with information on the programs being implemented, how your state is measuring school climate, and your contact information. Click on a state on the map below or select a state from this dropdown.